Even if I am all the way in Italy, I am glad to be invited to an event that is very important to the Americans. Memorial Day signifies heroism of the men and women who took part in defending their country. It's the day when everyone celebrates this recognition of patriotism. Defending your turf, your home, is what fulfillment is all about. And I salute these fallen soldiers, not only from one country but from every single country who lost their lives. On the lighter side, there is another aspect of the Memorial Day that everyone looks forward to. It's the occasion to take out those dusty barbecue grills and spend the day outdoors. It's the beginning of summer. 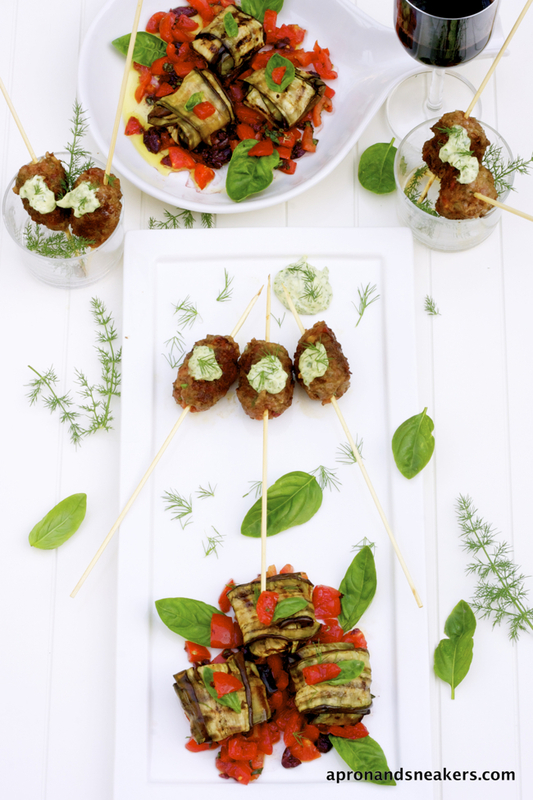 For this party with my fellow bloggers, I made some grilled meat and vegetables the Italian way. It's a great way to use summer's yields. I actually handpicked all the herbs from my potted garden. It was wonderful to snip off such green luscious leaves and use them for cooking. I really didn't know what to prepare for this party. I just knew that it has to be something grilled. Barbecue season has officially started here too and my barbecue cookbook has been indispensable the past days. As I was scanning the pages, I found the perfect recipes I thought would be great for an outdoor potluck party. Grilled skewered meat mixed with speck, the Tyrolean smoked ham, is a very tasty combination with an Italian-Austrian twist. The herb mayo rounded up the flavor. 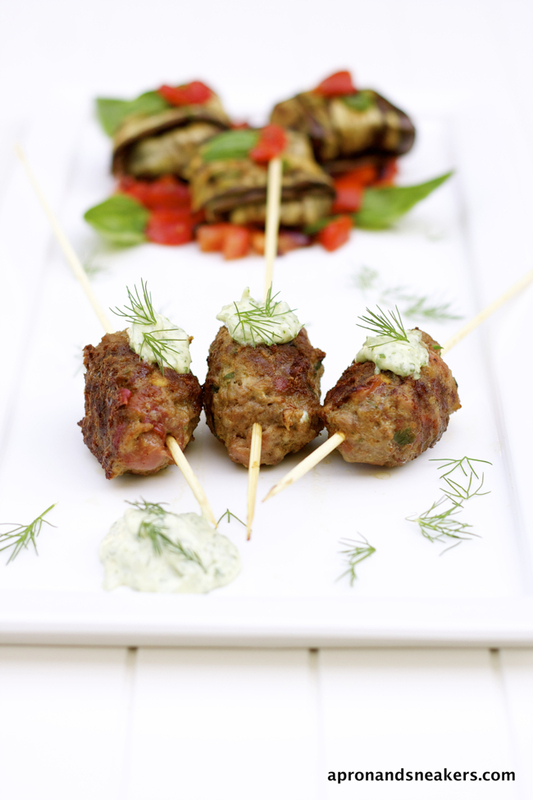 The aubergine bundles with provola cheese on a bed of Mediterranean tomatoes is a good partner to the meat skewers or it can also be a dish on its own. Eaten fresh out of the oven, while the cheese is still melted is a must. 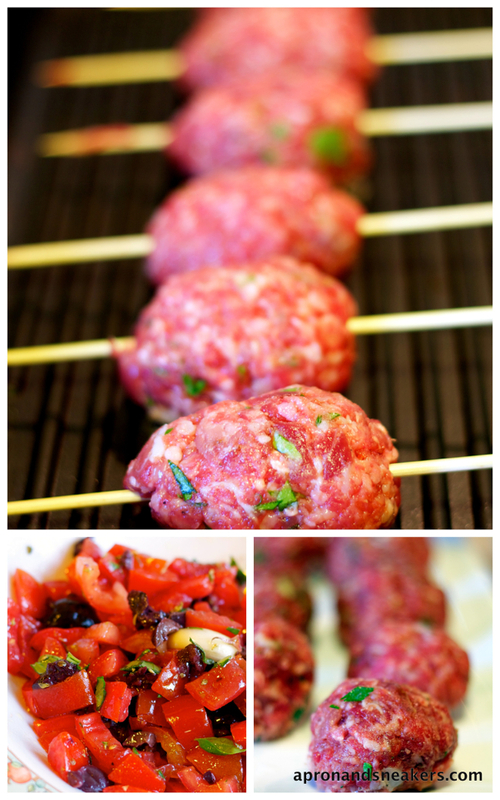 Both recipes were taken from the book Sapori Italiani, Barbecue. 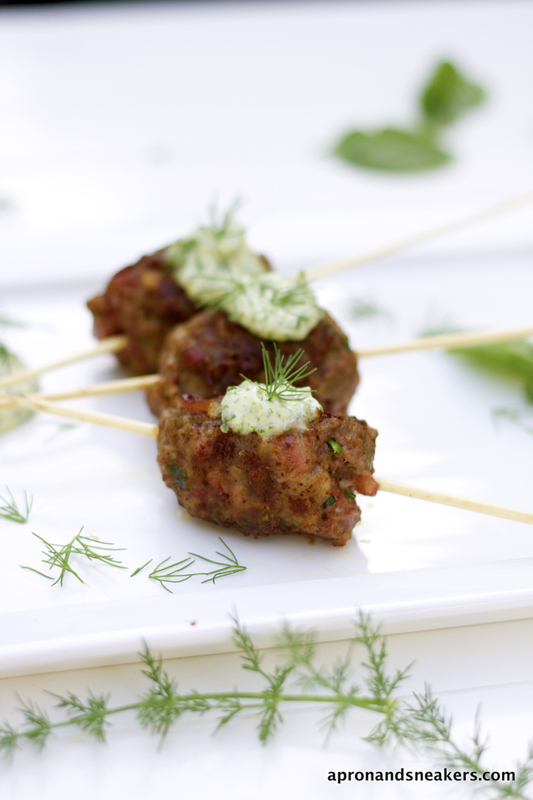 I modified the meat skewer recipe a little bit, omitting the cumin and coriander. The speck is already very tasty so I thought there was no need for more spices. I also changed the ground meat from 100% beef written in the original recipe to 50% pork and 50% beef. You can retain the 100% beef if you prefer. Happy Memorial Day to everyone and I hope you enjoyed my contribution to this potluck! Please don't forget to check out the rest of the potluck spread we prepared. Just click on the links to see how delicious they are! Have fun! Crush 1/2 of the garlic and put in a small saucepan with warm (about 30 seconds on the fire) extra virgin olive oil. Let it cool. Discard garlic when you are about to mix the oil with the meat. Put parsley, chili & the remaining 1/2 garlic on a chopping board and chop finely. In a bowl, put the ground mixed meat. Add oil, speck, parsley, garlic & chili mixture, egg yolk, salt & pepper. Mix well with the hands until the meat becomes compact. Get a spoonful and form it like a ball then shape it like a sausage. Insert a wooden skewer in the middle. Repeat until you finish the meat. Mix mayonnaise and minced herbs in a bowl. 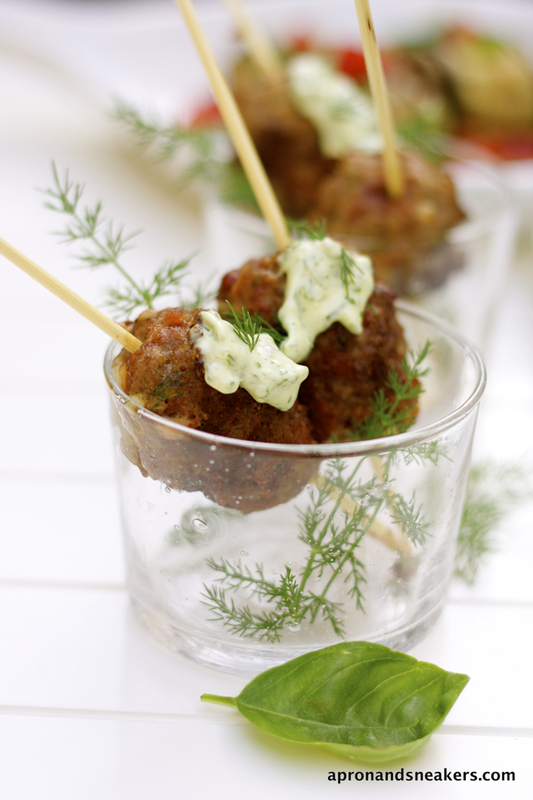 Serve with a dot of mayonnaise on the meat skewer. Grill both sides of aubergine slices. Meantime, in a bowl, combine tomatoes, basil, olives, garlic, extra virgin olive oil, salt & pepper. Leave for about 10 minutes to make the flavors blend together. Discard garlic. 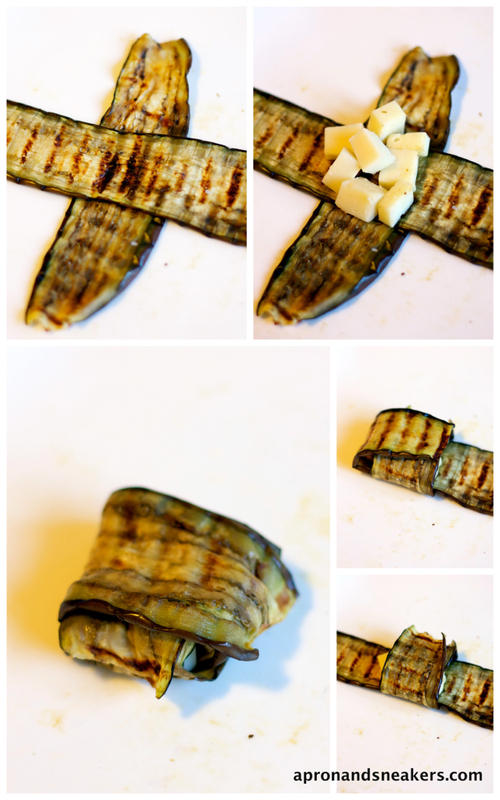 Lay one slice of grilled aubergine on a plate then put another one on top of it, making a cross. . Put some diced provola in the middle and close. Please refer to pictures on top. Make 8 aubergine packages or more if there are more ingredients left. In a small baking pan, put the tomato mixture. Top with the aubergine bundles. 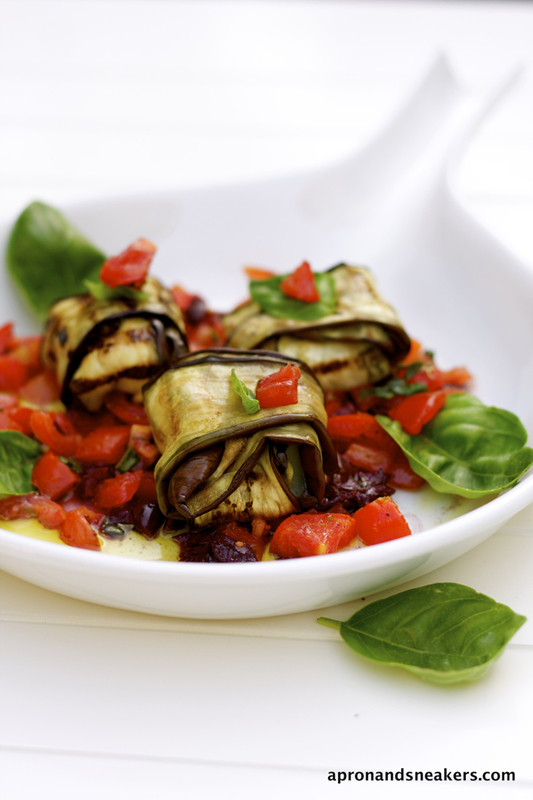 Sprinkle aubergines with salt & pepper and drizzle with extra virgin olive oil. Bake in a pre-heated oven at 220 degrees Celcius for 5 minutes. Serve immediately while the provola is still soft and warm.